The multiple strip surgeries naturally left a series of linear scars. The scalp reduction left the patient with scalp deformity, including an egregious slot formation. 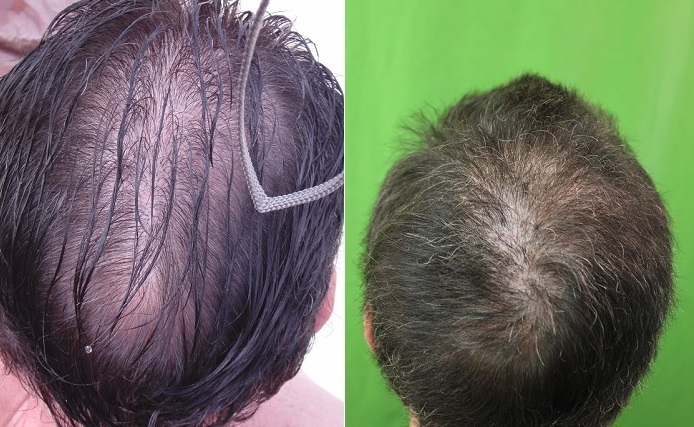 And like many patients seeking repair after more than one surgery, there was a shortage of scalp donor hair follicles. Because of this, conventional hair transplant methods would be futile for these types of cases. Because this patient had an abundant supply of beard hair, these follicles were able to expand his donor pool to create the coverage that he ideally wanted. Dr. Umar invented specialized technology called UGraft. It is designed to accommodate many types of hair on the body and remove them safely. With this instrumentation, it is possible to harvest large volumes of body hair grafts so that patients could benefit from much higher levels of coverage. His before and after images shown below reflect results seen at the eighteen month point. The patient is very pleased with his outcome and being able to finally reach the resolution that he wanted to end his hair restoration journey. His video which features more images and the patient’s personal feedback is available here.